This one is for the saps. And I say that as a card-carrying member, who types this with eyes still glassy from watching the new 50th Anniversary DVD of An Affair to Remember. It's a sappy movie, and it doesn't get any less sappy with age. Though, I must say, I think the older I get, the more I like it. I don't know if I am gathering a greater capacity for cheesy emotion instead of wisdom as I trundle on into the autumn of my years, but it's possible. Immortalized as the ultimate chick flick in Nora Ephron's Sleepless in Seattle, this 1957 movie from writer/director Leo McCarey (The Awful Truth) is apparently not supposed to appeal to members of my gender, but frankly, boys could learn an awful lot from Cary Grant's masculine example in this film. Grant plays Nickie Ferrante, last of the famous international playboys. When Nickie boards a transatlantic cruise to meet his fiancée (Neva Patterson) in New York, it makes the news programs around the world. Could the notorious gadabout really be settling down? Certainly his future wife's multimillion-dollar fortune is enticement even if love is not. On the trip, Nickie meets Terry McKay (Deborah Kerr), a former nightclub singer also sailing to meet her fiancé (Richard Denning). Terry is devoted to the man who took her out of smoky bars in order to make her a proper woman, and so she easily rebuffs Nickie's charms. It's a new experience for him, and the lothario is flummoxed. The chemistry that exists between these two is one unlike anything they've felt before, and no matter how much they try to pull apart, they always end up right back together. After a sidetrip to meet Nickie's adoring grandmother (Cathleen Nesbitt) during a port stop, the two can't deny it any longer. They also can't deny that they are in a sticky situation as far as their mutual engagements, so they make a plan to take six months to disengage. Nickie, in particular, is going to break away from the old ways, take a shot at reviving his artistic aspirations and being a painter, and prove he can make his way in the world in order to be deserving of Terry's hand. The pact the pair makes is the one Ephron famously borrowed for her Tom Hanks/Meg Ryan vehicle. In six months, at 5 p.m., if they are successful in their endeavors, Nickie and Terry will meet each other at the top of the Empire State Building and then go to be married. It takes approximately half of the movie to get to the point where the deal is struck, a seemingly lopsided structural decision, but one that is integral to making An Affair to Remember more than your typical sudsy romance. In the first hour of the movie, Nickie and Terry really fall in love. I am not sure I fully appreciated how real their interactions on the ship come off in any of my prior viewings (and it's certainly something my esteemed colleague missed in his review of the previous 2002 DVD of An Affair to Remember). McCarey doesn't go for any of the obvious tricks in bringing his lovers together, instead he exercises tremendous restraint. The whole of An Affair to Remember has an air of calm, and in that calm, McCarey is able to foment feelings of desire, longing, and eventually sadness just by letting the actors be themselves. Cary Grant and Deborah Kerr reportedly improvised a lot of their dialogue in the courtship scenes, and it shows. At times, they seem genuinely surprised at the things that come out of each other's mouth, and the natural interchange between the two makes for honest romantic yearning. You're not just going to believe they are in love with each other, but that they actually like one another, as well. McCarey maintains this restraint through the entire picture, even when it would have been easy to go for the emotional jugular. The meeting at the Empire State Building doesn't go off as planned, for reasons I won't get into for those who may have never seen An Affair to Remember before. Suffice to say, there is plenty of pain and misunderstanding, and even though the audience is privy to more information than Nickie, there are some things that McCarey teases out slowly. The big revelation of how bad off Terry really is, in particular, could have been handled with far more fanfare. McCarey doesn't even turn up the score, letting the moment come silently, and cutting away as soon as he's sure we've figured it out. Clumsier films would have lingered, tried to tug our heartstrings with excessive force. Instead, the director saves his biggest moments for the final scene, which itself is still played very carefully, isolated to one room, without the actors raising their voices or explaining too much. A heartfelt look will do far more than false words ever can, and the devastation on Cary Grant's face when the reality of the situation becomes clear is easily one of the actor's finest moments. It's when the tears hit my eyes, that's for sure. So, call me a sap, I don't care. I've never been a closeted romantic, anyway. An Affair to Remember has outlasted all the scoffing it's gotten from the likes of you in the past, and it's gonna keep truckin' long after both of us have shuffled off this mortal coil. Maybe one day you'll wise up, and like Nickie Ferrante at the end of the movie, realize what a stinker you've been. Then again, maybe not. Just because I'm a romantic doesn't mean I'm not also a realist. 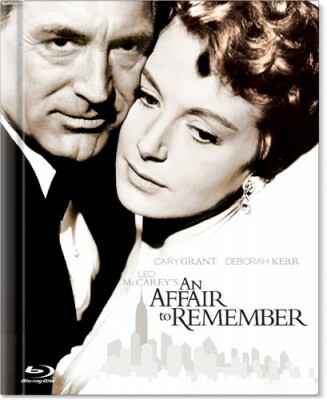 The Blu-Ray edition of An Affair to Remember doesn't sprint too far ahead of the 50th Anniversary Edition of the movie, released in 2008 (which I originally reviewed back then, and since I was happy with the text, I reused it here). I was pleased with that old edition, and this one improves on it, though it's not the drastic change we've seen in other Blu-Ray upgrades. The 2.35:1 transfer has excellent colors, with a slightly cooler look than we've seen before. The level of detail is strong, with particularly nice depth of field when looking at McCarey's regular use of rear projection of his sailing-the-seas backdrops. There is a fine grain to the image, though at times some trace of the digital source in background--not likely noticeable unless you are really, really looking for it. An Affair to Remember has had a pretty fair shake in the DVD age, so no major improvement has really been needed. Unless you require major miracles on every BD, you should be happy. One upgrade on the disc is a new 5.1 DTS-HD Master Audio soundtrack (AVC @38 mbps). There isn't much subtle mixing in the multi-channel track, but it does have a good, full sound coming out of all the speakers. The 2.0 mix from previous discs is also included, and it has excellent clarity and may be more pleasing to those who prefer more authentic sound mixes on old movies. A French soundtrack and a mono Spanish dub are also included, alongside subtitles in English SDH and Spanish. All of the features from the previous 2-disc release are carried over here and contained on a single disc. The only thing missing is a physical extra, an envelope reprinting the original lobby cards from the movie's theatrical release. This has been replaced by new packaging: a handsome hardback book with a 24-page booklet bound inside. The booklet is full of color photos and liner notes. * Audio commentary with singer Marnie Nixon (who dubbed Deborah Kerr's singing voice) and film historian Joseph McBride. This is the only bonus on DVD 1. It's a good track, with Nixon in particular talking about a job we don't hear about that often. * "AMC Backstory," a twenty-five minute program about the movie from the excellent series that used to run on the AMC cable channel before they became the station where modern movie sequels go to die. * Fox Movietone News coverage of the premiere of the movie, dug out of the vaults and lasting around a minute. * The original theatrical trailer. * Poster and stills galleries. These documentaries aren't exclusively An Affair to Remember-centric. The two actor-focused pieces are entirely about their major relationships and are built on interviews with the spouses that survived them. The Leo McCarey program is about the director's life and career, with just a pitstop to An Affair to Remember, with interviews from film scholars, including Peter Bogdanovich--the same folks who discuss the style of the movie in the last documentary. The Wald featurette is similar, but more personal, gathering interviews with his sons, brother, and widow. Highly Recommended. An Affair to Remember is a classic romance, with a convincing relationship between two characters played with considerable charm by Cary Grant and Deborah Kerr. Though it is extremely melodramatic, An Affair to Remember comes by its sentiments honestly. The laughs are real, and so are the tears. The Blu-Ray doesn't jump leaps and bounds ahead of the last DVD release, so your decision to upgrade is dependent on your dedication to the movie and/or Blu-Ray technology, but in terms of overall packaging and quality of content, it's a real winner.